Imagine my surprise to wake up on the morning of October 4th, only to learn that Mount Washington had their first dusting of snow. I’d almost be willing to bet that last year’s snow-pack hasn’t yet entirely melted! Nonetheless, Mother Nature is gearing up to wallop the West Coast with another epic snowy season. So will Mount Washington annihilate the 15-metre record set last year? Only time will tell, but I have no doubt that those slopes will be buzzing with anticipation over the coming months! 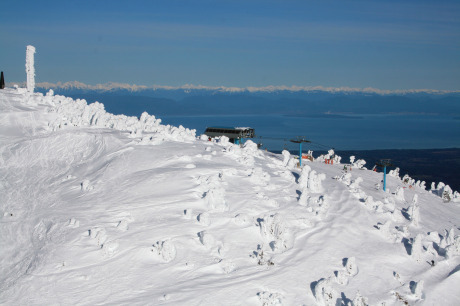 Mount Washington Alpine Resort opens for winter operations on Friday, December 10, 2010. The resort is located 30 minutes above the Comox Valley on Vancouver Island. WestJet, Central Mountain Air, Pacific Coastal Airlines, and Island Express service the Comox Valley Airport (YQQ). To find out about accommodation and package information, call Mount Washington Alpine Resort at 1-888-231-1499 toll-free or locally at 250-338-1386. Surf to their website for additional information including the live snow cam and information on season passes. I had no idea! Already?! Amazing. I love Mt. Washington, it is definitely the hidden gem mountain of BC.